Many people don’t fully understand the difference between blinds and shades. Most consider it as just the same thing with different names. Both blinds and shades are window treatments for all kinds of windows; however they describe two different qualities of window coverings. Blinds is a window treatment that’s composed of horizontal or vertical slats that can be adjusted to control the amount of sunlight and air allowed in a room. Wood, Faux Wood, Mini Blinds and Vertical Blinds are the most popular blinds and are usually made of wood, aluminum, bamboo and PVC materials. However, shades do not have slats like blinds. In fact shades are considered as soft window treatments which are made of fabrics or woven woods that rolled up and down. It can be opened from bottom, or both ends to control light and privacy. And just like blinds, shades are also available in different types – the most common are Roller Shades, Roman Shades and Dual Roller or Cellular Shades. 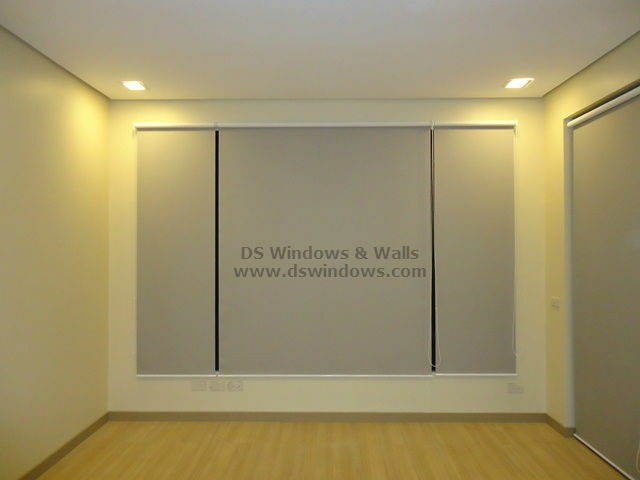 One of our clients in Pasay use blinds and shades in her new condo unit. She chooses to install Fabric Vertical Blinds in the living room and Roller Shades in her bedroom as window treatments. Our client also favor to use blackout fabric materials for both the vertical and roller shades since she values her privacy and also wanted to avoid sunlight specially while she’s resting. Fabric vertical blinds are useful window treatment for large spaces such as patio doors and large windows that needed privacy that our client wanted to achieve. Having a large window in her living room fits perfectly with fabric vertical blinds plus it can also control her outside view by adjusting the slats base on her needs. It’s simple yet functional and offers a fresh and warm ambiance in her living room. As for the bedroom our client wanted something more simple and comfortable yet elegant looking window treatment. Something that roller shades can offer, it’s chic and has the air of sophisticated characteristic that bring modern ambiance in a room. It’s easy to use and truly provide privacy and block sunlight plus it’s simple to clean by using a vacuum cleaner you can remove the dust.